Can anyone spot the 5th and 6th faction? I see Gladiators, Darkoath, Beastmen, Harpies. For a moment I thought there was a Skaven, but now I think that's just a Darkoath with a skull hat. 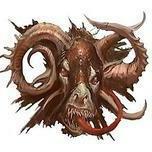 The Beastmen icon isn't for beast men, they're in the starter set and look like Ghurish Barbarians. Gladiators look like Chamon ones as well so maybe each of the factions will be from different realms. One or more may actually even have beastmen and daemons in them for all we know. My main issue with warcry is that if it's chaos only then not many people I know are going to be interested in it. So rather than an aos kill team where everyone already has most of the tools to start playing, it's asking people to buy a whole new chaos warband / starter set just to try it out. I also don't really want to buy a big starter box filled with scenery, just because I play at a local shop and it would be difficult to bring it all each week. So I am hoping the warbands at least get releases on their own like the necromunda gangs. I do think it looks really cool, I just hope people who aren't chaos players will give it a chance. I hope they learn their lessons from Silver Tower in terms of sprue logistics, though. The Grot Scuttlings situation should be avoided, so as to allow these new sculpts to be usable in the main game for more than just "counts as". Well Those Grots did have rules for AOSv1... And in terms of design, they were the exact prefiguration of the Gloomspite Gitz ! And they still live in the design of the Gobbalooza. But yeah ; like for Warhammer Quest BSF, the models for one of their Skirmish level games should come with rules for the "main" wargame too. Having rules for AoS1 before the squatting made it even worse really, as many would have bought into them with the assumption that they would be an AoS unit going forward. --- I count 7 of them : the boss, the lady with a whip, the crouched guy with two axes, the guy with two spears, the guy with a two-handed weapon (horns up), the guy with a two-handed axe (horns down), the Chaos Hound. The Spikes warband are warriors in almost "full plates" ; their armor and weapon looks very "modern" which makes me think they are from Chamon. --- 5 guys it seems : the boss, the (other) lady with a whip, the guy with two hammers, the guy with a shield, the BIG GUY (4you). The mini dragons birds (4 ?) and the Chaos Furies (6 ?) are probably NPC ennemies. Instead of AoS Kill Team we got AoS Necromunda. Heavy warband (instead of gang) focus, 6 warbands (instead of 6 gangs), character development etc. First i was disappointed as i hoped for an AoS Kill Team, but the longer i look at it (and i'm no chaos fan) the more i'm interessted. But to be honest, this was the same for necromunda and skipped it. But i'm really interessted to hear how the game is to be played. Shooting, cover and such a like makes "easy" tactical choices (Necromunda) - an all-in melee pit does not (Warcry?). The word "kinetic" used to describe the gameplay made me real hyped about the rules. You are right ! there is another red guy with a shield. So this is necromunda, but instead of imperial gangs only, they've opted for chaos gangs only. I'm not sure I have any interest in the game itself, but the scenery might make it worthwhile to pick up, it'll be dependent on the retail price. one thing is for sure by the time they've rolled all this out you'll be able to field a really diverse and characterful Slaves to Darkness/Darkoath/Everchosen army. you've got a pretty solid new model basis for your army there to sit alongside existing units like the varanguard and the like, only needs a few more 'big' models like Chariots to spice things up. could easily see the narrative element of Warcry being these tribes battling for power and Archaon's attention/favour in the AllPoints with the end result being them united under one leader which segues neatly onto the release of a chaos undivided battletome. You know, if they do gangs by realms as several had suggested that would be really cool. The wild looking guys from Ghur makes sense, as do the armored guys being from Chamon. It looks like the folks fighting the armored dudes in the art might be from Ulgu. They have a very specterish and stealthy vibe. The turquiose reminds me very much of Tomb Kings. the red Not so much. 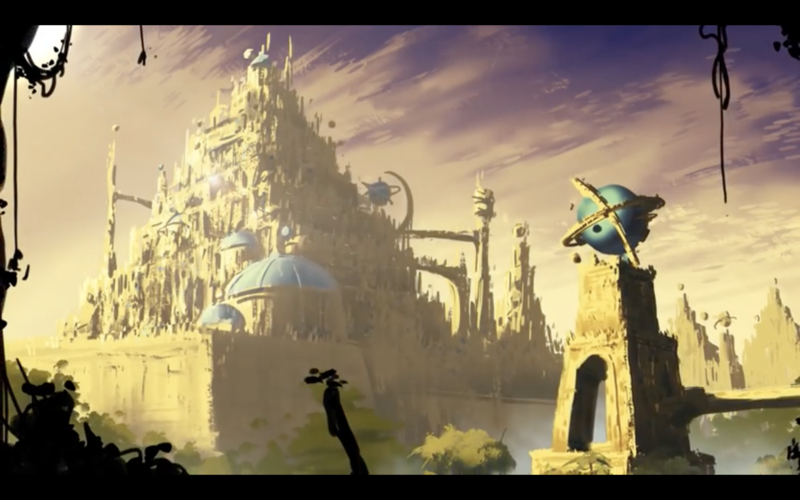 it looks like the Egyptian temple was there first and afterwards the azyrites build sth. around it. The skulls above and the door bow partly look like the the old Arcane Ruins that are OOP right now. Warcry looks fantastic! 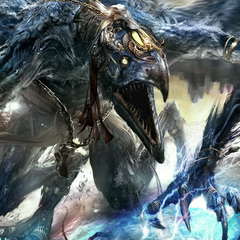 The harpies/furies way to take an ugly model and make it outstanding! Also it might be that the first wave is just Chaos - heck read any of the short stories and there's everyone fighting in the Chaos battles and skirmishes so I can well see them branching out to other armies - just seems its Chaos flavour for March/early year for GW. Great way for GW to end on a high note for AoS! This looks great, GW's on a chaos undivided roll at the moment. I like how they're diversifying the aesthetics away from "Khorne = this" or "Nurgle = this". Having a beast hunter (tamer?) theme and a more armoured gladiator theme is interesting. These being respectively Ghur-ish and Chamonite/Aqshy-ite seems plausible, which would make them the first models so closely tied to particular realms, apart from (kinda) the original endless spells. 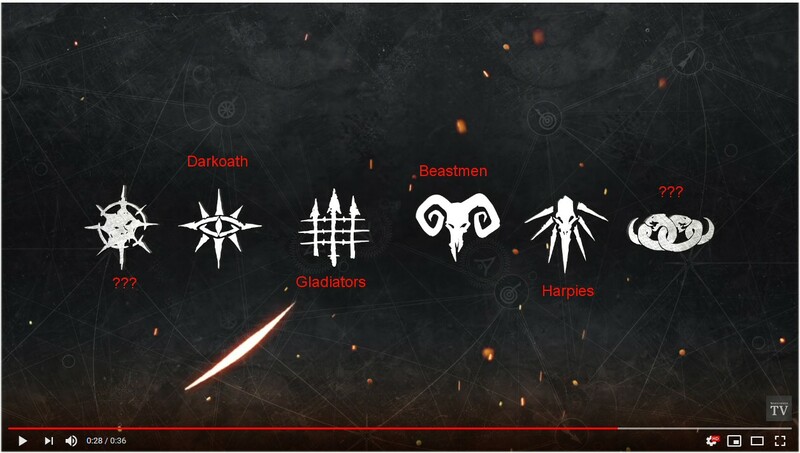 It does make me wonder how much of this we can reasonably use to infer about a main line Darkoath AoS force, if these six warbands are going to be as divergent from each other as they seem. Here's hoping it has more of a (roughly) narrative or campaign emphasis like Necromunda rather than the competitive focus of Underworlds or, more recently, Kill Team. If they can draw campaign inspiration from the old Path to Glory - the incredible WHFB 6th edition pseudo-RPG warband rules, not the anodyne current set - even better. D100 mutation tables are too much to hope for but still... Underworlds has the most competantly put together ruleset I've ever encountered from GW (bar LOTR) and Hitnerlands was clever, characterful stuff so I have high hopes. Fighting for a location with untainted water or beast herds, battles over who has ownership of sacred sites, actually deciding on the patronage of the Varanguard through champions' duels, there's a lot you can do. I always loved the Moorcockian/dying earth feel of warbands in the chaos wastes, the kind of thing you got in MacNiven's Scourge of Fate, Rob Sanders' Archaon novels or, ultimately, the old Realms of Chaos books (and their lower fantasy incarnation in Abnett's Riders of the Dead). The internal dynamics of power struggles, the path of the champion, the fighting for resources and divine favour between half-mutated weirdos under blood-red skies. And clearly Mad Max: Fury Road gave some of those aesthetics a new lease of life. Would other forces be interesting? Sure, if they were tailored to the setting of the Eightpoints. A ragged crusade of devoted Sigmarite flagellants. Starving Idoneth, stranded far from the sea and hunting souls to stay alive. Hardbitten ironjaws, whittled down to a core of dudes after 'da greatest scrap'. That sort of thing. Otherwise I'm perfectly fine with all-chaos. Necromunda and Mordheim both showed how you can have a lot of interesting force diversity (compare Goliath with Delaque, or to a lesser extent Middenheimers with Marienbergers) without having to tick every box for a matching main AoS faction just because. Also: mini dragon-bird = cockatrice hatchlings? I bet (and posted it in the Warcry thread ) that the Chaos-only focus of Warcry won't last. Sigmar will send Stormcast kill teams to murder any groups that get too far, witch hunters/devoted have found a spot where they can pick and choose who to burn that day, Orks going there would have an endless supply of battle-hardened opponents, etc.. Let's just hope that they pump stuff out on a schedule more like Underworlds than Necromunda. This looks great (helps that I'm a Chaos player). For me, the big headline (based on Furies being remade) is that undivided Daemons are back and getting some love. New Daemon Prince kit when? I bet (and posted it in the Warcry thread ) that the Chaos-only focus of Warcry won't last. Sigmar will send Stormcast kill teams to murder any groups that get too far, witch hunters/devoted have found a spot where they can pick and choose who to burn that day, Orks going there would have an endless supply of battle-hardened opponents, etc..
Similiar could be sad about Necromunda, that deep down the hive you could send in Imperial Guard, Space Marines or some sort of Undercover Xenos in the style of Tau Pathfinders or Eldar Rangers, but they did not - As Necromunda is a very coherent setting which lifes and emboddies the outlaw-gang-skirmish-nojustice-survivalofthefittest esthatic which is great i think. This will fit the Allpoints too. It's such an outlaw-getoutofmyway-gang-skirmish-survivalofthefittest setting that chaos driven warbands battle in the allpoints - the epicenter of chaos in the mortal realms - to get the most attention from the gods and be the champ. Any other faction would simply destroy this gangvibe as those are military troops and not gangs/warbands. Theres even more to think about, like how should the rewards look for e.g. stormcast in a chaosgift driven reward system? I don't expect to "shop" items like you do in necromunda, as it should be fairly difficult to finde a grocery store in the allpoints. Besides, the allpoints should be extremly difficult to reach for anything not chaos.